Custom Framing, Artwork and More! Ornaments for your tree or special gifts! We can do that!!!! We frame all kinds of treasures! We pride ourselves in creating the best presentation for your treasured items! Our training and knowledge allows us to put together the most attractive combination of mats and frame selected to compliment your art piece. Choose from over 2000 frames….there is one unique frame just right for you and your space! Art problems SOLVED at the Pear Tree Gallery!! We also try our hardest to help our customers with problems and questions they have about their treasures and heirlooms. If we don’t know the answer we have a network of artists and framers and restoration experts to contact. 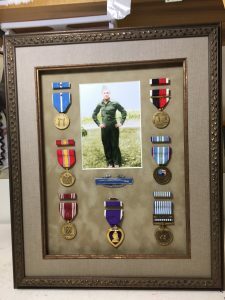 This entry was posted in Uncategorized and tagged framing, medals, shadowbox, treasures, USA on March 2, 2016 by wp-admin. “Pop a Cork & Paint!” An evening of FUN!!!! The Pear Tree Gallery hosts this fun painting event “every” second Wednesday of the month. Doors open at 5:30 for all Pop a Cork and Paint Events. Painting begins at 6PM and ends approximately at 8:00. Catch up and finish and photos, 8:00 to 8:30. Cost includes supplies, instructions, refreshments and giveaways! Prepay $35 to hold your place! Attend one or all of these FUN EVENTS!! This entry was posted in painting, Uncategorized and tagged acrylic, canvas, fun painting, painting, party on March 1, 2016 by wp-admin.